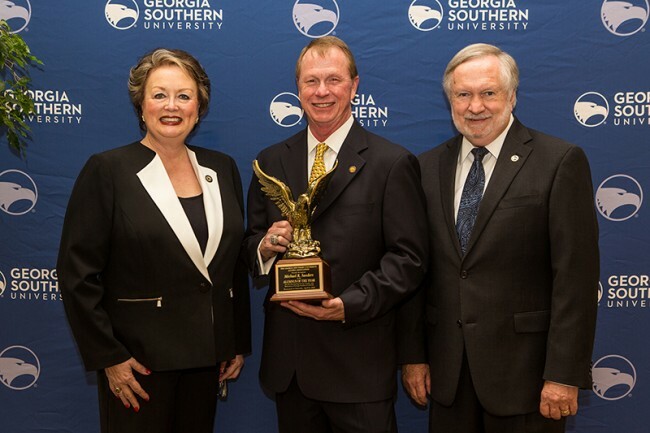 Georgia Southern University presented its 2015 Alumni Awards at the annual Alumni Association Awards Dinner held this pastSaturday at the Nessmith-Lane Conference Center. ● Susan E. Finger, Department of Biology Alumni Award. Finger, who received her Bachelor of Science degree in biology from Georgia Southern in 1973, currently serves as the program coordinator for the U.S. Geological Survey (USGS) at the Columbia Environmental Research Center in Columbia, Mo. She also works as the science advisor and USGS liaison for the Department of Interior’s Natural Resource Damage Assessment and Restoration Program. The author of more than 30 peer-reviewed publications and reports, she is a fisheries ecologist and aquatic toxicologist who has studied the effects of fire-fighting chemicals on aquatic and terrestrial resources. Finger also holds a Master of Science degree in fisheries and wildlife from Oregon State University. ● Cedric D. Henry, College of Business Administration Alumni Award. Henry earned his Bachelor of Business Administration degree in business management in 1973, and is the co-founder and COO of Millennium Corporation, a government contractor, in Haymarket, Va. He retired from the United States Navy after 20 years of service, where he completed two tours of duty in Desert Shield/Desert Storm. In 2014, he was recognized by the White House as a “Champion of Change” and is a five-time Inc. 5000 honoree. ● Brad Trower, College of Health and Human Sciences Alumni Award. Trower received both his undergraduate and graduate degrees from Georgia Southern University: a Bachelor of Science degree in health science in 1993, and a Master of Science degree in exercise science in 1996. He is currently vice president of business development and strategic planning at St. Joseph’s/Candler in Statesboro, and also worked there as an athletic trainer, the director of sports medicine, and as executive for orthopedics. In addition to his degrees from Georgia Southern, he also earned an MBA from the University of South Carolina. ● Pratt Farmer, College of Liberal Arts and Social Sciences Alumni Award. Farmer, a 1976 graduate of Georgia Southern with a Bachelor of Science degree in communications, is director of marketing for Cooper Carry in Marietta, Ga. He is an Accredited Public Relations Practitioner, a Certified Sales Professional and is affiliated with a number of professional organizations, including the Homebuilders Association of Metropolitan Atlanta, Georgia Agape, the Marietta/Cobb Fine Arts Association and the Boy Scouts of America. ● Joseph Barrow, Ed.D., College of Education Alumni Award. Barrow earned his Bachelor of Science in health and physical education in 1980 and a Master of Education degree and certification in administration and supervision in 1987, all from Georgia Southern. He received his Doctor of Education degree from Nova University. He currently serves as the superintendent of the Fayette County Board of Education in Peachtree City, Ga. Prior to that, he was the superintendent of the Ware County Board of Education. Barrow serves on state and national nonprofit boards and advisory committees impacting education and health care. ● Robin Rich, Allen E. Paulson College of Engineering and Information Technology Alumni Award. Rich received two degrees from Georgia Southern: a Bachelor of Science degree in mechanical engineering technology in 1982, and an MBA in 1992. He is a systems engineer for Automation Systems and Controls, Inc., in Statesboro, Ga. Previously, he worked in engineering at Great Dane Trailers and Brooks Instrument Division of Emerson Electric. ● David Woodrum, M.D., Ph.D., College of Science and Mathematics Alumni Award.Woodrum earned an undergraduate degree in physics from Georgia Southern in 1994 before receiving his M.D. and Ph.D. from the Medical College of Georgia in 2001. He is assistant professor of radiology at the Mayo Clinic College of Medicine in Rochester, Minn., where he also completed his internal medicine internship, his radiology residency and an interventional radiology fellowship. Woodrum has published more than 50 articles in peer-reviewed journals and has been awarded more than 20 grant-funded research projects. ● Raimi Ewetola, M.D., Dr.P.H., Jiann-Ping Hsu College of Public Health Alumni Award.Prior to receiving his Doctor of Public Health degree from Georgia Southern in 2013, Ewetola earned a Master of Public Health degree from Armstrong State University and an M.D. from the University of Lome. He currently serves as a U.S. diplomat and deputy director for the Centers for Disease Control and Prevention’s Global HIV/AIDS Division in Savannah, Ga. He is an adjunct faculty member of both Georgia Southern and Armstrong State University, a member of the Georgia Department of Public Health, and a consultant for the World Health Organization. ● Michael R. Sanders, Alumnus of the Year Award. Augusta native Mike Sanders, who received a Bachelor of Business Administration degree in marketing in 1981 from Georgia Southern, is a three-decade veteran of the financial services industry. He began his career with Morgan Stanley where he served for more than 25 years, rising to senior vice president for investments. He currently works as senior vice president for wealth management with UBS Financial Services. Sanders is a member of the Georgia Southern Foundation Board of Trustees, is a former University Alumni Association member and is a charter member of the Foundation’s 1906 Society. He and his family have endowed two scholarships at the University — one for students in the University Honors Program and one for athletics. Georgia Southern University, a public Carnegie Doctoral/Research University founded in 1906, offers more than 125-degree programs serving more than 20,500 students. Through eight colleges, the University offers bachelor’s, master’s and doctoral degree programs built on more than a century of academic achievement. Georgia Southern is recognized for its student-centered and hands-on approach to education. www.GeorgiaSouthern.edu.